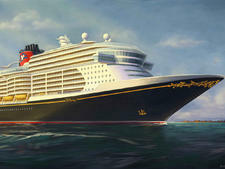 The youngest ship in Disney Cruise Line's four-vessel fleet, the 2,500-passenger (4,000 max occupancy) Disney Fantasy debuted in March 2012 and is geared toward seven-night Eastern and Western Caribbean itineraries (including a stop at Castaway Cay, DCL's private island). 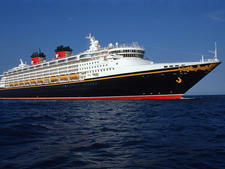 There's no neon, jam-packed bar or bank of glittery ascending elevators in Disney Fantasy's marvelous three-deck atrium -- just a bronze statue of Minnie Mouse, a grand piano, marble floor, a curving staircase and enough art nouveau flourishes to keep would-be designers in awe for days. (The chandelier alone is a jaw-dropper.) The entire affair takes its cue from a peacock, so there are feathery swirls aplenty -- even in the metalwork gracing the walls -- and a rich Caribbean palette of blue, green and gold. Interior balconies on all sides provide excellent vantage points for the events held there, including performances (vocal and instrumental), character greetings and even a tree-lighting ceremony at Christmas. The ship boasts many other fun touches, too, including the AquaDuck water coaster, an innertube water slide that circles above the pool deck; magical portholes showing real-time sea views in inside cabins; the uber-deluxe Remy French restaurant; and sophisticated venues for teens and adults. Notably, children can enjoy some of the best kids clubs at sea -- the result of a 2017 refurb -- featuring the Marvel Super Hero Academy and Star Wars Command Post. Public spaces remain a sea of polished wood and Disney artwork, and cabins are spacious with thoughtful touches like divider curtains and USB charging outlets. At the risk of sounding cheesy, what's amazing about Disney cruises is that they bring magic to everyone onboard, from solo cruisers and adult couples to families, without shoving it down anyone's throat. There's a delightful balance of kid- and family-focused activities and adults-only pursuits that ensures the little ones and even the most kid-phobic of travelers will have a great time. Disney's primary market, of course, is families, especially those with young kids. 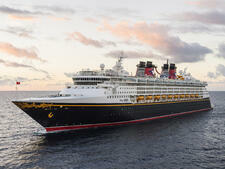 However, teen cruisers will find much to like in the venues geared toward them. 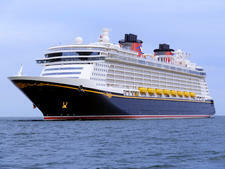 Beyond that, Disney has strong appeal for multigenerational travelers, and its spa, bar district and alternate dining facilities mean that adults of any age will find their own spaces onboard. The passenger makeup is dominated by American and Canadian travelers. The dress code is casual during the day and resort casual most evenings. Think jackets for men, but no ties, and pants outfits or summer dresses for women. Shorts are allowed in the main dining rooms. (Note: While jeans are allowed in Palo, shorts and flip-flops are not.) Dress-up is part of the Disney shtick, however -- be it princess gowns for young girls or tuxes for dads. Many passengers dress to the nines on Fantasy's sole semiformal evening, and you'll be shocked at how many people throw themselves into pirate night, so pack your eye patch and fake parrot. Gratuities can be prepaid or added to your onboard account, and they are given to dining room servers and stateroom attendants. The rate is $12 per person, per day and there's an automatic 15 percent levy for service on alcohol and 18 percent on spa and salon services.